National Geographic has an article on Artificial Reefs this month including our own Vandenberg. Why fish can't resist sunken ships, tanks, and subway cars. It took just over two minutes for the missile-tracking ship General Hoyt S. Vandenberg to sink to the bottom of the ocean. On a clear morning in May 2009, seven miles off Key West, a series of hollow booms erupted from inside the vessel’s hull, where 46 explosive charges had been buried deep below the waterline. The sharp smell of gunpowder drifted on the breeze, and an obscuring veil of black smoke began to rise, but for a long moment the ship didn’t seem to register the shock. She just hung there level in the water, 523 feet long, a rusting, decommissioned hulk with two useless radar dishes that towered above the ocean surface. Then, as news helicopters circled above and thousands of onlookers watched from boats idling beyond the blast zone, the Vandenberg slowly hitched downward into the Atlantic, remaining perfectly horizontal until finally the bow dropped and the stern rose, leaving nothing but a roiling tract of white water. "There'll be fish living on that wreck this afternoon!" declared Joe Weatherby, the man who had spearheaded the massive project to sink the Vandenberg and turn it, over time, into an artificial reef that would lure divers and fishermen to Key West." Herbert Nitsch has uploaded a video diary from a free diving visit to Palau. He provides some impressive dropoff imagery in the clip. "Palau 2010 Part I is the first episode of a 5 part video diary series, which I hope you'll enjoy. The clips were filmed during my recent stay in Palau (Micronesia), a beautiful archipelago in the Pacific Ocean. We travelled around the islands on the liveaboard Ocean Hunter III. The footage was filmed with Canon EOS 5D MarkII and a Subal housing. The music is from the album Funkungfusion. Great stuff! I love the album and strongly recommend it. The song in part I is 'The Lie-in King' by The Irresistible Force"
Just came across a collection of large higher resolution images of various artificial reefs in the world. The Oriskany, a decommissioned aircraft carrier, was towed 24 miles off the coast of Pensacola, Florida, Wednesday, May 17, 2006, to form an artificial reef. A different view of the Vandenberg off the Customs House in Key West. A view to the north to Key West over the resting place of the Vandenberg. Sending tanks to sea as reefs in the Gulf of Thailand. Subway cars to reefs from New York off Delaware. This reminds me of an early AR effort in the early 1960's with street cars in California. Not sure what sort of charges they used to scuttle the frigate HMNZS Wellington off New Zealand but they do look impressive! The initial sinking of the Spiegel Grove off Key Largo in 2002. Neil Watson and Guy Harvey dive the Sapona south of Bimini. The Miracle of Life is one of the newer wrecks to be dropped off this section of coast. It was acquired and sunk in large measure due to the efforts of Dixie Divers http://dixiediver.com/ of Deerfield Beach, FL.. This is a large and very complete dive shop. The most complete in this area in my estimation. I went out and free dove the wreck within a couple of hours of its sinking. Imagine trying to breathhold dive on a small wreck in moderately strong current in brown poor visibility of about 30 ft.?! It was a challenge finding it and then deciding which way to turn to see the front of the vessel. Anyway, the following video was shot in exceptional blue water visibility well in excess of 100 ft.! More about the history of acquiring and sinking this wreck. It is costly and time consuming proposition. They pulled it off however. Note: don't attempt scooter free diving without adequate pro training and careful experience development for the special area of free diving. It isn't that hard to get killed otherwise! Last edited by RickI; 04-26-2011 at 04:47 AM. I think these may all be females, males are less common anyway. You can see the male love bites on two of these, tough love! Also, the heartbreak of remoras strikes again. You should see these shark suckers in the Red Sea, talk about piling on. Here is a video of a single scooter free diving drop on the same trip off Port Lucaya, GBI at the Pygmy Caves. There were a few sharks in the area. I was curious to see how they would react to the noise, electric field, etc. of the scooter. They largely seemed to ignore it unless I turned away from them or came too close. They would turn and follow if I steered away and would try to evade if I came in too close. By the way, don't attempt scooter free diving without proper training and skill development. Otherwise it is a pretty easy way to get killed. Last edited by RickI; 04-27-2011 at 08:30 AM. 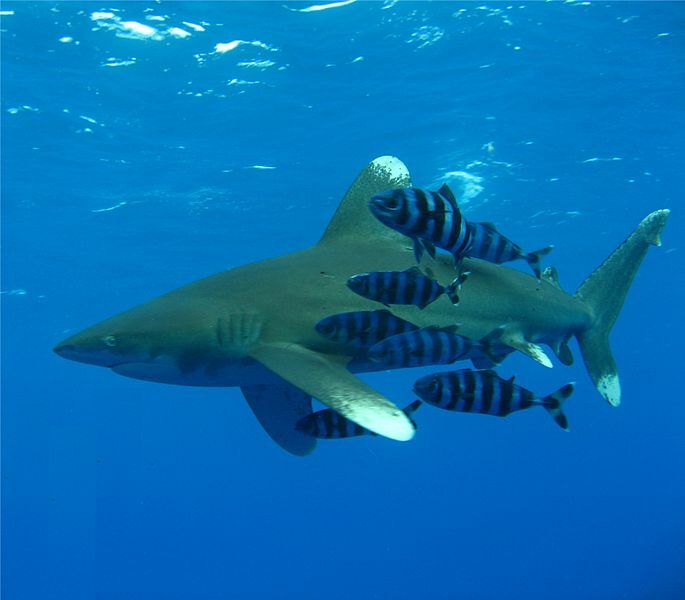 "We are taking a small group and heading out in search of the elusive and rare oceanic whitetip shark around the deep water drop offs near Cat Island in the Bahamas. This is a land based, off the beaten path adventure. The trip package includes 6 days of diving, transfers to and from airport, and our stay at the dive lodge during our time on Cat Island. Each morning we will head out in search of the sharks and return in the evenings back to the island. We are limiting this trip to six guests so if you interested in joining us, let us know. This is both a snorkel and scuba diving adventure, so scuba gear is needed. This trip is a guaranteed sell out so reserve your spot early! 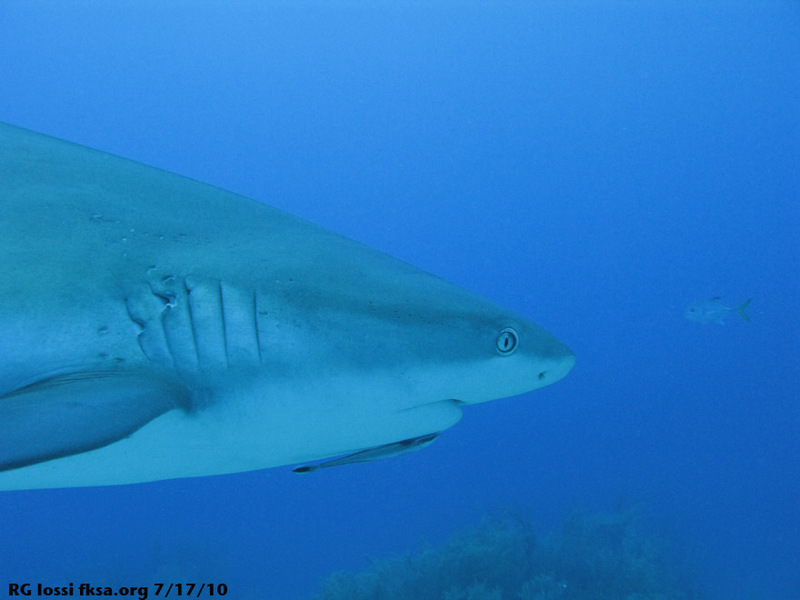 Visit - http://www.sharkdivermag.com for details"
We were looking forward to checking oceanic white tips out during a free diving trip to the Red Sea a while back. Unfortunately, they weren't around that time. 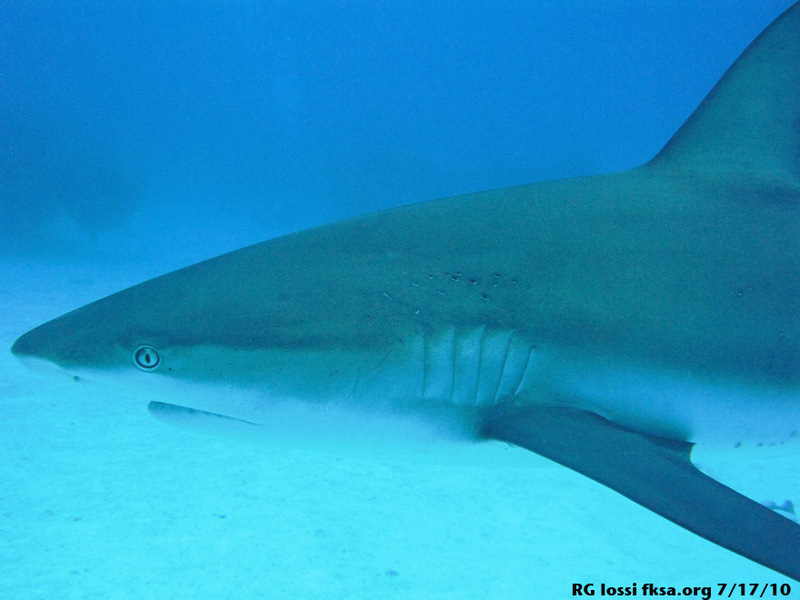 It is strange to see these sharks in the nearby Bahamas. They are apparently quite wide spread but I have yet to see one off Florida. "Grant Hogan breaks the US Men's Constant Weight No Fins National Record with a dive to 65m/213 feet!" A nice composite image of a former U-Boat sunk off North Carolina prepared by David Doubilet and Hal Silverman for National Geographic. These ghostly images, taken off the coast of North Carolina, show the first Nazi contribution to a region known by divers as 'the graveyard of the Atlantic'. The panorama is made up of 33 individual images, all painstakingly aligned from 70ft underwater by dive photographers David Doubilet and Hal Silverman. It reveals how U-352, the first U-boat sunk by the U.S., has become an artificial reef, home to a plethora of marine life. On April 7, 1942, commanded by Kapitanleutnant Hellmut Rathke, U-352, a Type VIIC U-boat, departed the French port of St Nazaire on its second Atlantic patrol. It took four weeks to cross the ocean, and was one of the first U-boats to attack shipping off the east coast of the U.S.
None of its raids were successful, however, and on May 9, desperate for a victory, Rathke fired on a Coast Guard vessel, the cutter USS Icarus. His torpedoes missed and having detected his position via sonar, the Icarus engaged with depth charges and then surface guns. U-352 sank about 25 miles off the North Carolina coast, where it remains today. The 220ft vessel came to rest in one piece, listing heavily to starboard. Its position in coastal Gulf Stream waters, only 110ft deep, has made it a popular dive spot - though would-be explorers must share the wreck with thousands of bait fish, not to mention barracuda and tiger sharks. The outer hull has decayed to reveal the skeletal remains of the pressurised inner hull, but many notable features remain, including the conning tower and torpedo tubes. "Photographers David Doubilet and Hal Silverman have had a composite of thirty-three images showing the full hull of the German World War II U-boat, U352, published in the UK Daily Mail. The submarine was sunk off North Carolina on 9 May 1942, and was the first U-boat to be sunk by US forces. 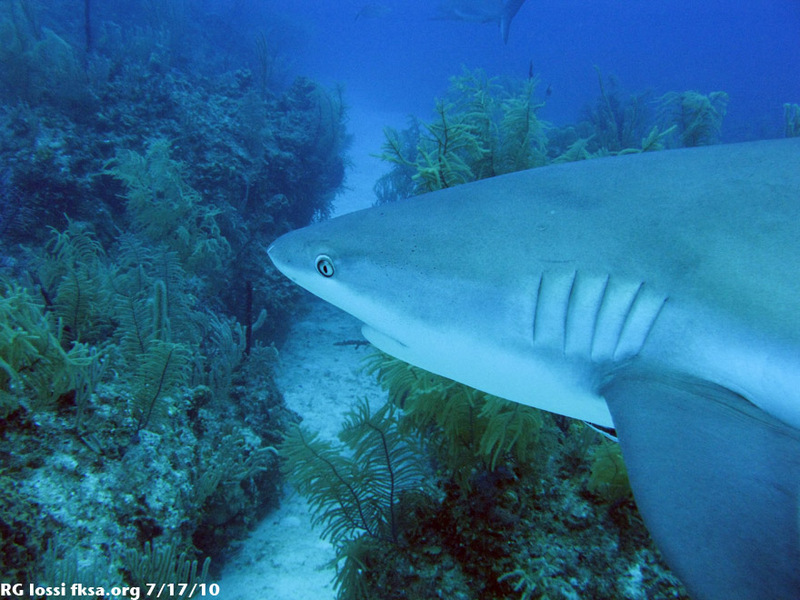 The images were all shot with Nikon D3 cameras in Seacam housings. The wreck sits at 110 feet (34 meters) and the pictures show the extent to which it has been colonized to provide a home for marine life over the past 67 years. We went up to cave country over the 4th of July weekend and hit a number of springs. Here is a short video of a single scooter free diving drop in Troy Spring in Branford, Lafayette County, FL west of Ginnie Springs. It is a fascinating sinkhole dropping to about 80 ft. with rock exposures on three sides and a talus slope on the fourth. This first magnitude spring discharges a meandering stream over and through shallow limestone features into the Suwannee River. The video was shot with a GoPro HD camera in an Eyeofmine.com corrective housing. Troy Springs Conservation and Recreation Area is located in Lafayette County, along the south side of the Suwannee River. The area takes its name from the 68 foot deep Troy spring, located approximately 200 feet up a short run from the river (Rosenau et al. 1978:210-213). The state has acquired approximately 80 acres that is being managed by the Office of Greenways and Trails, Department of Environmental Protection. Natural communities include high-quality sandhill, xeric hammock, upland pine forest, upland mixed forest, spring-run stream, aquatic cave, and blackwater stream (OES 1995:B42). Three cultural resources have been located on the property; two prehistoric archaeological sites and one underwater historic shipwreck. The underwater site was known prior to the C.A.R.L. survey of the property, but the two prehistoric sites were previously unknown. Research was also conducted on the historic towns of Old and New Troy. Troy Springs is located at the juncture of three prehistoric culture areas: North, North Central, and North Peninsular Gulf Coast. Florida's culture areas, represented geographically, are reflections of different prehistoric adaptive strategies based, in large part, on ecological factors (Milanich and Fairbanks 1980). Beginning around 500 B.C. these factors played major roles in the development of regional cultures that are recognized archaeologically. Prior to this time period, there are more common cultural characteristics than differences and the culture periods are identified in broader terms. Beginning around 12,000 years ago, sites identified as belonging to the PaleoIndian tradition appear in Florida. These sites are marked by the presence of particular types of stone tools--most commonly Suwannee and Simpson projectile points, unifacial and bifacial blades and knives. Because of lower sea levels, groundwater levels in the central upland regions of the state were much lower and the landmass of Florida was about twice what is today. Many of the known PaleoIndian sites are associated with water sources such as deep springs, shallow lakes or prairies with associated limestone strata (Milanich 1994:2). Beginning around 9,000 B.C. water levels began to rise reducing the size of Florida. By around 7,500 B.C. environmental changes had sufficiently altered the lifestyles of inhabitants for a separate period to be recognized by archaeologists. The Archaic period is marked by an increase in population, a more settled lifestyle, and a larger variety of specialized tools. By around 2,000 B.C. pottery was in use, and by the end of the late Archaic period (500 B.C.) regional cultures are recognized. As mentioned, Troy Springs is located at the juncture of three culture areas. By around 500 B.C. several separate manifestations of the Weeden Island culture were apparent in the region. The early Weeden Island ceramic assemblage is characterized by the presence of Swift Creek complicated-stamped pottery, punctated and incised Weeden Island types, and undecorated pottery. By later Weeden-Island times, the Swift Creek pottery disappears and is replaced by Wakulla Check Stamped pottery. Weeden Island is notable because of the distinction between secular and sacred pottery styles, with mortuary and ceremonial contexts containing animal and anthropomorphic effigy vessels. By around A.D. 750 sufficient changes had occurred in the ceramic inventory for archaeologists to recognizes two new cultures in the region, the Suwannee Valley and Alachua cultures. These cultures appear to have developed out of, and perhaps overlapped, the late Weeden Island cultures of the area. The Suwannee Valley cultural assemblage consists of undecorated and decorated pottery. Types of decoration consist of surface-roughening, check-stamping, cord-marking, cob-marking, punctating, and brushing. The Alachua cultural assemblage is very similar, but is found slightly to the south of the Suwannee Valley region and exhibits differences in the proportions of cob-marked pottery (Milanich 1994:348-353; Johnson and Nelson 1990:48-61; Worth in Weisman 1992:188-205). Indian Pond, a more specific ceramic tradition within the Suwannee Valley culture, is recognized by the presence of cord and fabric-marked ceramics and a poorly understood linear-marked pottery type (Johnson and Nelson:1990:60). Just before, during, and after contact with Europeans a cultural complex identified as Leon-Jefferson is recognized. Changes in surface decoration, rim modification, vessel form, and ceramic technology, as well as other cultural changes are associated with Leon-Jefferson. The addition of European goods and technology to the existing prehistoric lifestyles produced profound changes in the aboriginal populations. Following the Spanish conquest of Florida a system of missions was established across North Florida and the panhandle. The Spanish missions were designed to control native populations, supply a labor source, and create a defensive line against the English. A number of mission sites have been identified and excavated by archaeologists in North Florida (Milanich 1995:167-183). Disease and English attacks on the mission Indians caused massive depopulation of the North Florida region. The absence of native populations combined with uneasy English-Indian relations lead to the immigration of Creek and related tribes in the mid-18th century. These Indians eventually became known as Seminoles. Florida was ceded from Spain to the United States in 1821. At this time the Seminoles had become prosperous in the North and North Central Florida regions, raising cattle as the Spanish had done. American politics, pressure from settlers, and uneasiness towards the Indians lead to the 2nd and 3rd Seminole Wars, intended to subdue and remove the Seminoles from their Florida lands to Oklahoma. Lafayette County was created from the division of Madison County in 1856, at the time it also included what is today Dixie County (later removed in 1921). Settlement in this region of Florida was slow during the 1830s and 1840s due to the strong Seminole presence. Violence between Seminoles and Anglo settlers spurred the need for army forts, which were established along the Suwannee River, major roads, and other major drainages. The 2nd Seminole War saw the removal or flight of most Indians from the area of Lafayette County, and this is reflected by increasing Anglo populations in the 1840s and 1850s. The town of Troy, or Old Troy, "located about 8 or 9 miles up the Suwannee River from present-day Branford," served as the first county seat of Lafayette County. The exact date this community was settled is unclear, though Melton (1974) notes that a post office was established at Old Troy on 27 July, 1845. Postal records indicate that a post office was established at Troy (spelled "Tray" in the official records) on 22 July 1846 and discontinued 31 July, 1847 (Pickett et al. 1957:50). Some sources say the county courthouse, as well as other structures, burned in 1865, near the close of the Civil War, by Union sympathizers and deserters from the Confederate Army (Warnke 1971:30; undated article from the Gainesville Sun). Lafayette and neighboring counties were a haven for deserters and Union sympathizers; in 1864 Major Campfield and 300 Confederate calvary and 225 infantry swept through the region hunting deserters and burned the homes of many loyal citizens as well (Melton 1974). Melton (1974) reports that Old Troy burned in 1856, well before the beginning of the Civil War. The exact location of Old Troy remains a mystery. Melton (1974) states that the settlement was built on the banks of Troy Springs. This, however, was not an ideal spot, since river flooding would fill the nearby sloughs and cut the settlement off from the river and nearby trails. Melton (1974) further states that the remains of old log houses were seen at Troy Springs, though no evidence remains today. When the town of Old Troy was burned it was comprised of a one-story log courthouse, five stores, two doctors, a saloon, and post office. Legend suggests that the county judge was warned of the impending disaster and was able to remove important papers from the town. The survey plat of Township 5 South, Range 13 East, dated 1852, was examined for evidence of the location of Old Troy. No indication of the town was found; Troy Springs is simply labeled "lagoon." Some subdividing of sections around Troy Springs and New Troy is shown, perhaps providing us with some indication of settlement in this general area. Once the town of Old Troy had been consumed by the fire, the settlers decided to relocate to a nearby site. This location is better established, and more information is available about New Troy. The date on which New Troy was established, however, presents a puzzle. Melton (1974) indicates that Old Troy was burned in 1856, and New Troy built shortly after, with a post office established in 1860. Postal records show that a post office was, in deed, established at New Troy on 25 August, 1860 (Bradbury and Hallock 1962:59). The situation is further confused because New Troy changed its name to McIntosh in 1861; this fact is confirmed by maps dating to the period, as well as the post office records. By 1871 the town name had reverted back to New Troy, though some map makers of the early 1880s show both New Troy and McIntosh--perhaps as a hedge to their own confusion. As noted above, however, Old Troy was to have burned in 1865 at the end of the Civil War, so if New Troy was established in 1860 it would mean both towns coexisted. The fact that the Madison was scuttled in the Troy Springs run in 1863 (Melton 1974) lends credence to the suggestion that Old Troy was abandoned sometime in the late 1850s, with New Troy built further from the spring in 1860. New Troy had its share of problems following the end of the Civil War. Reconstruction attitudes and a high number of Union sympathizers in the county were confronted with increasing activity by the Ku-Klux-Klan. Friction between Republican and Democrat heightened the tension. Bell (1994) reports on the assassination of Judge John Krimminger in New Troy in 1871. Krimminger was active in local and state politics, and as a Republican and Confederate deserter was not well liked. Bell (1994) notes that a number of murders were committed, and there was a general consensus that the Klan was involved. Despite a number of witnesses, as well as the testimony of Krimminger's widow, the assassin managed to evade capture by moving from county to county, and by relying on sympathetic Democrat friends. A rather interesting account of New Troy in the 1880s is presented by Eugene W. Sears in Romantic History of New Troy, Capital of Lafayette County, written in 1936 as part of the Federal Writers Program. Sears was apparently the descendant of one of New Troy's pioneers, and used their family stories and recollections as the basis for his essay. Bell (1990) has recently republished this fictionalized essay with some notes on the characters and settings. Sears (in Bell 1990) describes the community as a thriving one, with a grist mill; two general stores; hotels; log houses with stick and clay chimneys; a Baptist Church with sermons by circuit riding preachers of various denominations; and, of course, the two-story courthouse. New Troy was also serviced by a ferry. An undated newspaper article on file at the Lafayette County courthouse lists other features of New Troy in the 1890s, including a cotton gin, sawmill, jail, boarding house, as well as Baptist and Methodist churches. Two newspapers were produced in New Troy-- The Lafayette County Messenger and The Lafayette County Enterprise, though neither is preserved in library collections today. The area was also a hub for steamboat traffic, and products like turpentine, cotton, vegetables, and oranges were shipped out. The New Troy courthouse caught fire and burned down New Year's Eve, 1892. Shortly after this county residents voted to move the county seat to Mayo, where it is today. The removal of the courthouse spelled the end for the little community of New Troy, and business soon began to fade. The undated article from the Gainesville Sun states that houses were dismantled for their timber and bricks, hardwoods replaced the fields, steamboat traffic ended in 1899, and the ferry closed in 1917. Prior to the C.A.R.L. Archaeological Survey investigations one underwater site (8LF5) had been recorded at Troy Springs, but the uplands around the spring had never been systematically examined for the presence of cultural resources. A combination of shovel testing and surface inspection in cleared areas was done across the property to determine if additional sites were present. During the months of May, June, and July, twenty-one 50x50 centimeter shovel tests were dug on the property. All but three of the tests were tied into one of two datums and a grid system was used for the placement of the tests. The first datum was an electric pole and the second datum was a telephone riser. The remaining three shovel tests (numbers 19-21) were placed arbitrarily. Two sites (8LF55 and 8LF56) were identified as a result of the C.A.R.L. investigations. Site 8LF55 was found during shovel testing. Little surface exposure was noted at the site. Sixteen shovel tests were excavated to determine the boundaries, both vertically and horizontally, and the cultural affiliation of the site. Site 8LF56 was first identified through surface inspection. A scattering of lithic material was noted on the surface. Five shovel tests were placed in the area to determine cultural affiliation, size, and depth. Three cultural resources have been located on the Troy Spring Conservation and Recreation Area. Two of the sites (8LF55 and 8LF56) are prehistoric and one site (8LF5) is an historic shipwreck. A summary of the three sites follows: The Madison - 8LF5: The steamship Madison served as a general store on the Suwannee River in the 1850s [much of the oft cited information on the Madison comes from an article published in 1903 by John M. Caldwell, a contemporary of Capt. Tucker, and one of the locals who helped scuttle the boat in 1863]. Once a week the ship would make the round trip from Cedar Key to the shoals above Troy Springs (usually as high as "Grab," about 2 miles north of Troy) picking up produce from the isolated homesteads along the river. In 1861 the Madison served as an ad hoc warship in the Confederate "Navy" when it was used to investigate and eventually take control of four vessels transporting supplies to the Union naval base in Key West. The ship was scuttled in Troy Springs upon orders from her owner, James M. Tucker, when he and his men (later known as Company H, 8th Florida Infantry) went to fight in Virginia (Barker-Benfield 1995). Through the years all but the hull has been salvaged. A detailed study of the remains of the Madison is being conducted by graduate student Richard Haiduven of East Carolina University and should be forthcoming. Troy Springs 1 - 8LF55: The site was found during the C.A.R.L. testing of the property. 8LF55 measures approximately 245 meters by 90 meters and extends to a depth of one meter below present ground surface in some areas. The stratigraphy of the soil varies slightly, but in general the area consists of 0 to 18 cm of grey/brown humic soil, 18 to 45 cm of brown and tan mottled sandy soil, and 45 cm to bottom of mottled tan and light tan to an orange/tan clay. Artifacts were recovered throughout all stratigraphic levels at the site and continued to be recovered at depths of one meter below surface. Often pottery recovered from such depths is explained as a mixing of upper levels with lower levels, a common problem in shovel testing, but at the Troy Springs 1 site, this occurred too often to be explained in such a way. Artifacts recovered during the testing include lithics, prehistoric pottery, bone, modern debris, and assorted material such as pebbles and iron concretions (see appendix). The majority of the artifacts were chert--258 pieces out of a total of 310 total artifacts. Analysis of the distribution of chert artifacts indicates that the heaviest concentration of material occurs in a roughly oblong area defined by shovel tests 1, 2, 3, 4, 6, and 12 (note that tests 1, 2, 3, 12 produced the majority of the pottery at the site). Of 258 chert artifacts, 201 (78%) came from these 6 tests. Analysis of the chert artifacts from this part of the site produces the following pattern: 140 (70%) complete flakes; 26 (13%) broken flakes; 26 (13%) fragmentary flakes; 7 (3.5%) debris; and 1 (.5%) core. In examining the complete flakes they were found to be larger than the broken and fragmentary flakes and they also retained cortex in 12 (8.5%) cases. The pattern observed here does not closely resemble the behavioral/technological groups defined in Sullivan and Rozen (1985:762-763). However, the high number of complete flakes would suggest core reduction, rather than tool production, as suggested by the Sullivan and Rozen (1985) model.
. The Weeden Island period predates, and during the later periods was probably contemporaneous with, Indian Pond. Taken as a whole, the ceramic assemblage can be viewed as representative of early Indian Pond culture. Although many pottery types usually associated with Indian Pond, such as fabric and cord-marked pottery, were not recovered, the total assemblage supports assignment to this culture. The general location of some artifacts was noted during excavation of the shovel tests. The majority of the material recovered often came from the second zone of the shovel test, described as a brown/tan mottled soil in units 1, 2, 3, and 4. In many of the deeper units, sherds and chert flakes were recovered from the deepest zones, directly above the orange clay that underlies much of the area. This includes the Weeden Island Plain sherd, some of the sand-tempered check stamped sherds, as well as sand-tempered plain sherds. Troy Springs 2 - 8LF56: This site was discovered during C.A.R.L. testing of the property. The site is approximately 96 meters by 90 meters, extending from the surface to a depth of approximately 50 cm. Material found on the surface and in subsurface tests is limited to undiagnostic chert flakes and no more than 5 flakes were found in a given shovel test (see appendix). Despite the sparse nature of the artifactual material, flakes were recovered from depths of 15 to 70 cmbs. A decorative brass(?) fitting was recovered in one shovel test to the north of 8LF56, and may be associated with the historic occupation of the Troy Springs area. Old Troy - 8LF12: This site number was originally assigned to the towns of Old and New Troy by Mildred Fryman (1971) as part of the Historic Sites Inventory. Information was insufficient at the time to plot the location of either town. This update of 8LF12 is primarily to distinguish Old Troy from New Troy; the remains of Old Troy are still undetected. 8LF12 now applies only to Old Troy. Some information, noted above, places Old Troy on the banks of Troy Springs, though no evidence was found during the present survey. Three archaeological sites have been located on the Troy Springs Conservation and Recreation Area property. While the possibility exists, it is unlikely that additional sites will be found within the present boundaries. If additional property is acquired it should be subjected to testing by the C.A.R.L. Archaeological Survey (850/829-9100). No subsurface disturbance should occur, or be planned to take place, within the boundaries of the archaeological sites without prior consultation with the Florida Division of Historical Resources (DHR), Bureau of Historic Preservation (850/487-2333). Most of the planned recreational activities on the property, such as boating, swimming, and picnicking, will take place in and around the spring. Two of the sites are located in this area, 8LF5-The Madison and 8LF55-Troy Springs 1, and it is likely that they will be impacted as a result of these activities. Careful planning in consultation with the DHR and the C.A.R.L. Archaeological Survey should be implemented to protect them. It is likely that a program of restoration of the banks of the spring will be considered. Again, consultation with DHR is necessary for protection of the neighboring cultural sites. Whenever possible the interpretation of cultural resources is encouraged. The setting at Troy Springs provides an excellent opportunity for the Office of Greenways and Trails to tell visitors about the prehistoric and historic occupation of the region. The C.A.R.L. Archaeological Survey can provide support and offer funding sources for an interpretative program at the site. Personnel are encouraged to call either 850/487-2299 or 850/829-9100. 1994 Murder in New Troy: The Assassination of Judge John Newton Krimminger, Based on the Testimony of Rebecca U. Krimminger, November 13, 1871. Printed by the author, Day, Florida. 1962 A Chronology of Florida Post Offices. Florida Federation of Stamp Clubs, Palm Beach. 1937 The Steamboat Madison. Typescript of an article originally published in a 1903 Tallahassee newspaper. W.P.A. Federal Writer's Program. 1971 Notes on Lafayette County, accompanying site file for 8LF12, Florida Site File, Bureau of Archaeological Research, Tallahassee. 1974 Lafayette County History and Heritage: An Anthology [Collection of newspaper articles, primarily by Melton]. 1994 Archaeology of Precolumbian Florida. University Press of Florida, Gainesville. 1995 Florida Indians and the Invasion from Europe. University Press of Florida, Gainesville. Office of Environmental Services, Division of State Lands, Department of Environmental Protection. 1995 Conservation and Recreation Lands Annual Report 1995. Board of Trustees of the Internal Improvement Trust Fund. In cooperation with Land Acquisition Advisory Council, Tallahassee. 1957 Florida Postal History and Postal Markings During the Stampless Period. Florida Federation of Stamp Clubs, Palm Beach. 1978 Springs of Florida. Bulletin 31 (revised), Bureau of Geology, Tallahassee. 1936 Romantic History of New Troy, Capital of Lafayette County, During the Early Eighties, edited and republished by Wilburn Bell , Day, Florida. 1992 Excavations on the Franciscan Frontier, Archaeology of the Fig Springs Mission. University Press of Florida, Gainesville. I would like to thank Judge Harlow H. Land, Jr for providing me with the initial information regarding the Troy Springs Archaeological Survey." Last edited by RickI; 07-06-2011 at 10:28 AM.